Clear plastic storage container includes six each of silver triangles and metallic black squares. 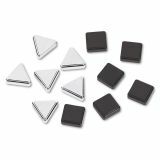 Quartet Metallic Magnets, Magnetic, Black; Silver, 12/Pack - 12 large magnets in modern geometric shapes secure and enhance postings on any magnetic surfaces. Convenient, clear plastic storage box keeps magnets in one place. Sleek metallic finish complements any contemporary Envi&trade;ronment. Set includes 6 silver triangles and 6 metallic graphite squares.